France has returned to Nigeria five ancient terracotta sculptures smuggled out of the country in 2010. The artefacts, of Nok origin, were found in the luggage of French citizen at a Paris airport. Their exact value has not been disclosed, but they are believed to date back more than 3,000 years. Nigeria's tourism minister told the BBC it was a "big achievement" in the country's campaign to recover its lost treasures from around the world. "I feel extremely delighted," said Edem Duke, who attended the ceremony to receive the sculptures from French embassy officials in the capital, Abuja. Over the last 85 years, Nok art has been discovered in a large area of north-central Nigeria from Jos to Kaduna. Experts say Nok art, which often represents human heads, is the earliest attempt at portraiture yet discovered in Nigeria. Nigeria's National Commission for Museums and Monuments believes that items of Nok culture show it was the first society to have used iron in sub-Saharan Africa. 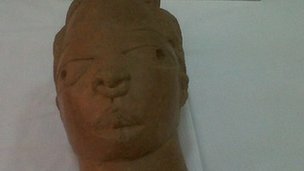 The BBC's Chris Ewokor, who attended the ceremony in Abuja, says the terracotta sculptures are believed to have been smuggled out of Nigeria to neighbouring Togo, from where the French buyer flew to Paris's Charles de Gaulle airport. It is a route thought to be used by smugglers to avoid customs checks at Nigerian airports, he says. France's ambassador to Nigeria, Jacques Champagne de Labriolle, told the BBC the artefacts' return was part of a global attempt to fight the "illegal trafficking of cultural goods". "It is both a decision by the French government and an obligation by all those countries that have signed the Unesco convention on the matter," he said. The return of the Nok sculptures would help in Nigeria's fight to recover its lost heritage, Mr Duke said. "It's a very symbolic achievement and it also sends a very important signal to the rest of the world that we will continue to pursue the repatriation of our heritage assets and treasures wherever they are," he told the BBC's Focus on Africa programme. Nigeria has long campaigned for the return of artefacts stolen when the British took over the kingdom of Benin, now southern Nigeria, in 1897. Its latest call has been for Boston's Museum of Fine Arts to return 32 Benin artefacts which were donated by a collector to the gallery last year.